When there's something strange (say, a gibbering demon) in your neighborhood, who are you going to call? Did somebody just said Voidlord meta? Ulduar T8 armor set is so sick. Does anyone know what's the mace he is holding? This really needs more demons with a downside you can silence to be useful, and even then he'd be niche. If Old Golds and some related cards were tagged as Demons, this card could actually see some usage. Sadly, C'Thun is not tagged as so (at least in the version they showed), so I guess none of them will. Its Hemet worth 20 dust. Fun Fact: This card can silence Jaraxxus the hero. I can say that I had the exact same thing happen to me. It's like crappy cards have more weight and drop more in packs. Holy golden animation....Silence? More like "Blind" - So many lights his effect should be "Battlecry: Give an Epileptic minion a seizure." 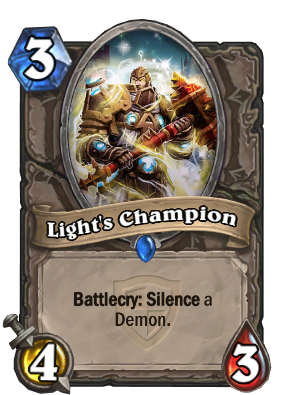 Let me list off all the demons remotely worth the silence, should you attempt to use this card as anti-Warlock tech. Generally unspectacular, though notably this card also undoes Demonfire, Demonheart, and Demonfuse. I will patiently wait for the Trolden video of the Bane of Doom into Mal'Ganis at 1 HP to be answered by top deck Light's Champion. Why kappa? Dreadsteed is THE demon requiring the most a silence. All the other can be dealt with without one. It could also be used on your own Wrathguard, if for some reason, you want to run both this awful silence and this awful demon. I will wait for the same Trolden video, except that the Light's Champion will come out of a Mulch given to the warlock by Nexus-Champion Saraad. What about using Power Overwhelming on a demon for a removal or a face hit, then using this to keep it afterwards? I found hilarious that the class that will most use this card will be Warlock. A Light's Champion in tha master of dark magic class. The Jaraxxus hero is not a minion. He can't be silenced. The Sacrificial Pact interaction is an outlier in this way; the devs are considering removing that interaction for consistency.